"Why injustice was meted out to our martyrs? What was the reason why attention was not drawn to build a memorial for the martyrs?" Prime Minister Narendra Modi on Monday launched an all out attack on the Congress accusing it of adopting a "family first" approach and said national security suffered due to "criminal negligence" of the previous dispensation, in remarks which came shortly before he inaugurated the National War Memorial here. 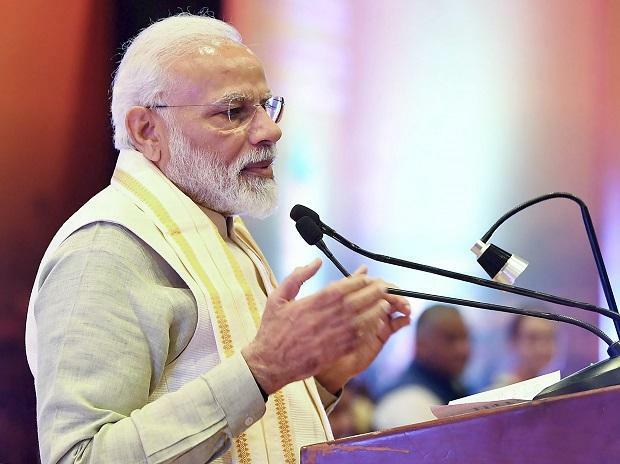 In his hard-hitting speech at a gathering of ex-servicemen, the Prime Minister referred to the Bofors scam, AgustaWestland chopper scam, Rafale issue and inordinate delays in procurement of critical military platforms and ammunition by previous government. Modi also listed steps taken by his government in enhancing India's military might, ensuring welfare of security personnel and ex-servicemen as well as in honouring the fallen heroes. "Why injustice was meted out to our martyrs? What was the reason why attention was not drawn to build a memorial for the martyrs? Was it India first or family first. The answer to this lies in the difference between family first and India first," Modi said, in a clear reference to the Gandhi family. He also trained his guns on the Congress on the Bofors and AgustaWestland helicopter scam. "From Bofors to helicopter, all investigations point at the same family and it says a lot. These people are putting all their might to ensure that Rafale jets do not come to India. When India's first Rafale will fly over the country, then it will demolish their conspiracies," said the PM. Paying his respects to the CRPF soldiers killed in the Pulwama attack, he said due to the sacrifice of many soldiers India is among the strongest armies in the world. Speaking on the occasion, Defence Minister Nirmala Sitharaman told the ex-servicemen, "What we need today is your trust, and trust in the Prime Minister," seen as seeking their support for BJP's return to power. Saying that for him it was India first, Modi asserted that "this pradhan sewak", a term he uses often for himself, will take every decision keeping the national interest supreme. "The decisions which were pending compromising national interests were being cleared one by one on priority basis," he said. Noting that the proposal for the memorial was mooted almost 25 years back, he said it saw some progress during the previous BJP-led NDA government headed by Atal Bihari Vajpayee but got stuck when the Congress-led UPA came to power in 2004. "In 2014 we started the process of building it and it has been completed before time. Friends, this memorial also signifies how a resolution can be fulfilled," he said. He asserted that his government cleared long-pending crucial defence projects and demands of soughtity forces on a priority basis as he sough to put the Congress in a dock on the issue of national security. The armed forces had sought 1.83 lakh bullet proof jackets in 2009 but it was only after his government came to power that over 2.30 lakh of them were bought. "Who is to blame for this sin and blot/" he asked, calling it criminal negligence with armed forces and national security. His government has also bought 72,000 modern rifles and spent Rs 25,000 crore on purchasing ammunition, he added. The reason for delay in the previous government and the decision taken by his dispensation is due to the difference between "family first" and "India first" mindset, he asserted. Addressing the ex-servicemen, he said the government will set up three super-specialty hospitals for them. The prime minister said "Modi is not important" and what is paramount are the nation's history, culture and civilisation. His government has implemented one-rank-one-pension (OROP) scheme for ex-servicemen and disbursed Rs 35,000 crore under it, he said, adding that their pension budget is now over Rs 1,12,000 crore and salaries of soldiers are up by 55 per cent. "A new India is marching forward with new vigour and energy," said Modi. The PM later inaugurated the country's National War Memorial (NWM) adjoining the iconic India Gate complex in the heart of the capital.